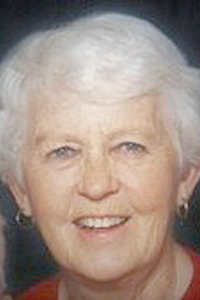 Bonnie Kitterman, 87, long time resident of Webster City, died Wednesday, January 16, 2019 at Southfield Wellness Community. A Celebration of Life Service will be held at 1:00 p.m. Saturday, March 2, 2019 at Asbury United Methodist Church, Webster City. Refreshments and fellowship will follow the service. Bonnie Elaine Caudle was born November 20, 1931, at Spencer, SD, the daughter of J. Wylie and Louise Peterson Caudle. She graduated from Ellsworth High School and Iowa State Teachers College. On December 23, 1951 Bonnie married Kenneth Charles Kitterman in Ellsworth, IA. They lived in Grand Junction and Guthrie Center; in 1961 they made their home in Webster City. They were blessed with three children, Jana, Jeff and Jo. Bonnie was an elementary school teacher and later a librarian at Iowa Central Community College for 25 years, retiring in 1996. Bonnie was a member of Asbury United Methodist Church and Chapter JE PEO. She was past president of Asbury United Methodist Women, an Asbury Bell Ringer as well as a contributor to many years of ongoing church activities. Bonnie had numerous talents and loved to cook, sew, play tennis, read, and spend time in conversation with dear friends and family members. Her spirit, friendliness, engaging wit and personality will be missed by us all. Bonnie is now resting peacefully in paradise with her beloved husband of 67 years, Ken. Her family includes daughter, Jana Warren and husband Bill; son, Jeff Kitterman and wife, Carole Bersin; daughter, Jo Schmidt and husband Paul; six grandchildren Laura Dahms and husband Matthew, Sam Kitterman, Jay Warren, Haley Schmidt, Shelby Moe and husband Patrick, Luke Schmidt; and great-grandson, Kip Dahms; brother, James Caudle of Story City; sisters, Rena Weidman of Breckenridge, MN, Alyce Paulson of Stockton, CA, Marjory Roelfs of Clive; as well as many beloved nieces and nephews and other family members. Bonnie was preceded in death by her parents; husband, Ken on February 1, 2018; brothers, Wayne, Harold, and Carroll Caudle. Memorial funds should be made out to “Bonnie Kitterman Memorial Fund.” Disbursement will be done by the family at a later date. Cards may be sent to Fosters Funeral and Cremation Center, 800 Willson Ave., Webster City, IA. 50595.